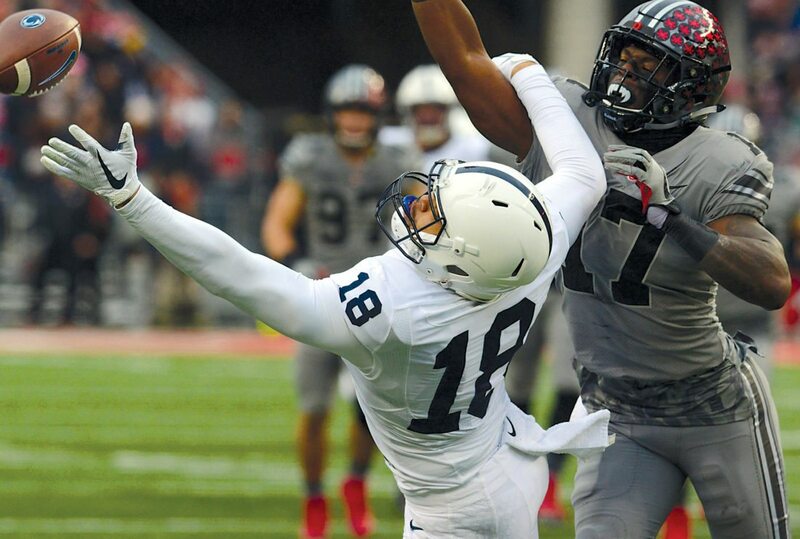 10/28/17 Patrick Waksmunski / Ohio State v Penn State / Penn State tight end Jonathan Holland (18) misses a pass by Ohio State linebacker Jerome Baker (17). COLUMBUS, Ohio — Penn State stole a thriller from Ohio State last year with the kicking game, but this time around, the Nittany Lions have to be kicking themselves for failing to finish off the Buckeyes. Penn State led by 14 points less than four minutes in, and by 18 points on two occasions. But J.T. Barrett and Ohio State’s offense shredded the top scoring defense in the country, rallying for two touchdowns in the final five minutes Saturday night. The No. 6 Buckeyes stunned the No. 2 Lions, 39-38, scoring the go-ahead touchdown on a Barrett pass with 1:48 remaining in front of 109,302 fans at The Horseshoe. The loss might have knocked PSU out of contention for a spot in the College Football Playoff, but only time will tell. “More than anything, I’m hurting for those kids in that locker room,” Penn State coach James Franklin said after the tough loss. The Lions (7-1, 4-1 Big Ten) appeared well on their way to a second straight huge victory over the Buckeyes (7-1, 5-0). Barkley took the opening kickoff back 97 yards for a touchdown, and then when Ohio State quickly turned it over, PSU scored again to make it 14-0 before many fans had even settled into their seats. But what happened over the next few hours was intriguing, in that Penn State was able to maintain a sizable lead, even though the Buckeyes clearly began to outplay the Lions on both sides of the ball. Ohio State kept shooting itself in the foot with mistakes, and PSU went up 21-3 then 28-10 in the first half. Penn State fans might have started feeling comfortable at that point, even though it was becoming evident that Barrett was able to do just about anything he wanted in the passing game, and Ohio State’s defense was starting to dominate PSU’s offensive line. “As the game went on, their offensive line was able to protect their quarterback, and he was able to stand in the pocket very comfortable,” Franklin said. Barrett put on a passing clinic down the stretch, completing his final 16 throws to set an Ohio State record. He finished the night an incredible 33-of-39 for 328 yards and four touchdowns. He also established a new Big Ten record for career passing touchdowns as he now has 94 (Drew Brees previously held the mark with 90). Penn State entered the day with the No. 1 scoring defense in the country, giving up just 9.6 points per game. Led by Barrett, Ohio State scored 39 points, amassed 529 yards, had 27 first downs and ran for 201 yards. Despite all that, and partly because of the Buckeyes’ mistakes, Penn State led 28-17 at the half and 35-20 in the fourth quarter. In a reversal from last year, when a blocked punt and blocked field goal for a TD helped PSU to a 24-21 win over Ohio State, this time the Buckeyes started their comeback with a big special teams play. Blake Gillikin punted from his own 43 early in the fourth quarter, and it was blocked by Denzel Ward, with Dante Booker recovering for the Buckeyes at the PSU 41. Ohio State scored two plays later on a 38-yard TD pass from Barrett to Johnnie Dixon. Penn State answered with a scoring drive, but didn’t get the touchdown it needed. Trace McSorley had a 23-yard run and later a 22-yard pass to Mike Gesicki as the Lions eventually got to first-an-goal from the 7. The Buckeyes held, though, and forced PSU to settle for a 24-yard field goal from Tyler Davis for a 38-27 lead with 5:42 left. By that point, Penn State’s defense had little hope of stopping Barrett and the Buckeyes’ passing game. He had all day to throw and picked apart PSU’s secondary with precision to wide-open targets. Ohio State moved 76 yards in just five plays, covering 1:17, and got a 10-yard TD pass from Barrett to Dixon with 4:20 to go. The Buckeyes went for two to pull within a field goal but were stopped, leaving PSU’s lead at 38-33. Ohio State still had two timeouts left, and Penn State’s dynamic offense needed probably two first downs to seal the win. The Lions started at their own 15 and didn’t come close to getting one first down, as the Buckeyes overwhelmed the PSU offensive line. Barkley, who was held to just 44 yards rushing on 21 carries, was blown up for a 7-yard loss on the first play by Dre’Mont Jones. Barkley was stuffed for a 2-yard loss on the next play, making it third-and-19. 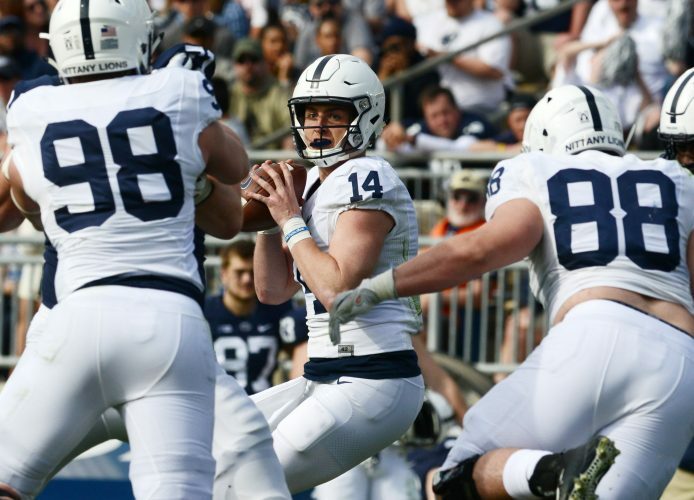 McSorley was 17-of-29 for 192 yards and two scores, and he also ran for 49 yards on 13 carries. But PSU was held to just 283 total yards, only 91 on the ground. Ohio State regained possession at its 42 with 3:07 to play. Once again, the PSU defense had no answer for Barrett, who hit consecutive passes of 20, 6 and 14 yards to move the Buckeyes to the 16. Barrett then tossed a 16-yard score to wide-open tight end Marcus Baugh for a 39-38 Buckeye lead with 1:48 to go. Ohio State again went for two and a three-point lead, but Barrett was stopped trying to run up the middle. Penn State still had 1:45 left, plenty of time for the potent offense, and needed just a field goal to win. Instead, the Lions’ continued to get destroyed by Ohio State’s pressure and had no chance to do much of anything. McSorley misfired on first down, was sacked for a 5-yard loss on second down and missed again on third down. Facing fourth-and-10 with the game on the line, McSorley was pressured out of the pocket, had no one open and threw another incompletion that turned the ball back over to the Buckeyes. That was the ballgame, and a PSU team that led throughout and appeared to be in control wound up walking off the field with a crushing defeat.